This is certainly one of the nicest months of the year. There’s nothing like walking out of the house to a crisp September morning knowing it’s going to warm up to the mid 70’s with low humidity. September is the time of year to give your lawn some TLC. The lawn seeding window re-opened last week. There is no better time of year to get that grass seed on the ground and get a new lawn started. The warm September days and the cool nights make it very easy to get a good lawn going. The cool weather from now until November then April thru June give you 5-6 good months to get that lawn established as long as you water the area. It’s also the time to get your fall ‘mums in the ground. The local garden centers will be filling their shelves with a rainbow variety of different colored mums, kales, and pumpkins to decorate your yard for the fall season. The garden centers will also be displaying their bulb collection as well. It’s time to plant daffodils, tulips, hyacinths, and some crocus so you have a nice burst of color and soon as spring arrives. Hydrangeas are a widely used plant here in the northeast. They are a profuse bloomer that will bloom from mid July right though October. The mop head flowers will be white for the first 4-5 weeks and as the weather cools they will gradually change to a pinkish color. Hills of Snow can be used as an accent on either side of a door. It can also be used as a bed out in the middle of the yard combined with some Black-Eyed Susan. That is a plant combination of two long lasting bloomers that will put a beautiful color spot in the yard for a couple of months. Hills of Snow is a zone 3 plant that likes partial shade to full shade. It grows 4-5’ high and wide. It can be cut back to the ground in the fall and will return the following year. As much as I still hate to use the four letter word ‘snow,’ the Snowmound Spirea is really an under-used shrub. It is one of the first spirea to bloom and has a wonderful arching branch habit that gets covered with white bunches of tiny flowers. The Snowmound can be used as an informal untrimmed hedge or as a lager mass of white in the landscape. 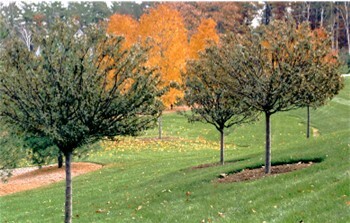 It’s yellowish orange fall color will only add to the autumn colors in your yard. Snowmound Spirea is a zone 4 deciduous shrub that likes full sun to partial shade. It grows to 3-4’ in height and width, has a rounded shape and bluish green foliage. We see the problem all the time and unfortunately, the answer is usually not what people want to hear. Moss is caused by shade, acid soils and poor soils – three things we have a lot of in New Hampshire! The first thing is usually shade, but no one wants to cut down the tree that their father planted 30 years ago. Or maybe you had a good lawn 30 years ago, but 30 years of trees going up around the property has shut off a large amount of sunlight. First, you need sunlight to grow grass, so cut those trees back. You’ll need at least 6 hours of sunlight on the grass, so watch the sun and how it moves throughout the day as it relates to your lawn. Second, our soil in New Hampshire is very acidic due to the pine trees, so add lots of lime, twice a year. Take a soil sample. The PH rate of the soil should be about 7. Poor soils? Dig it out about 5 inches deep, and put in good loam soil. Add irrigation and a four-application fertilization program and….. you have a lawn. Questions? Give us a call! 603.798.5048.